For the college in Wales, see Yale College, Wrexham. Yale College is the undergraduate liberal arts college of Yale University. Founded in 1701, it is the original school of the university. Although other schools of the university were founded as early as 1810, all of Yale was officially known as Yale College until 1887, when its schools were confederated and the institution was renamed Yale University. Originally established to train Congregationalist ministers, the college began teaching humanities and natural sciences by the late 18th century. At the same time, students began organizing extracurricular organizations, first literary societies, and later publications, sports teams, and singing groups. By the mid-19th century, it was the largest college in the United States. In 1847, it was joined by another undergraduate degree-granting school at Yale, the Sheffield Scientific School, which was absorbed into the college in the mid-20th century. These merged curricula became the basis of the modern-day liberal arts curriculum, which requires students to take courses in a broad range of subjects, including foreign language, composition, sciences, and quantitative reasoning, in addition to electing a departmental major in their sophomore year. The most distinctive feature of undergraduate life is the school's system of residential colleges, established in 1932 and modeled after constituent schools of English universities. All undergraduates live in these colleges after their freshman year, when most live on the school's Old Campus. 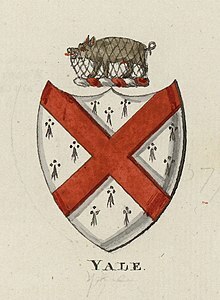 The Collegiate School was founded in 1701 by a charter drawn by ten Congregationalist ministers led by James Pierpont and approved by the General Court of the Colony of Connecticut. Originally situated in Abraham Pierson's home in Killingworth, Connecticut, the college moved to New Haven in 1718 and was renamed for Elihu Yale, an early benefactor. Founded as a school to train ministers, original curriculum included only coursework in theology and sacred languages. Although early faculty, including Jonathan Edwards and Elisha Williams, maintained strict Congregational orthodoxy, by the time of the American Revolution subsequent rectors, especially Ezra Stiles, relaxed the curriculum to include humanities and limited natural science education. Scientific courses introduced by chemist Benjamin Silliman in 1801 made the college an early hub of scientific education, a curriculum which was grafted into Yale's Sheffield Scientific School in 1847. As in many of Yale's sister institutions, debates about the expansiveness of the undergraduate curriculum were waged throughout the early 19th century, with statements like the Yale Report of 1828 re-asserting Yale's conservative theological heritage and faculty. Later in the century, William Graham Sumner, the first professor of sociology in the United States, introduced studies in the social sciences. These expanding fields of study were integrated with graduate schools of the university and amalgamated into a course of liberal arts education, which presaged the advent of divisional majors in the twentieth century. The relaxation of curriculum came with expansion of the extracurriculum. Student literary societies emerged as early as 1750, singing groups and student publications in the early 1800s, fraternities and secret societies in the mid-nineteenth century, and intercollegiate athletics by the century's end. Participation and leadership in these groups was an important social signifier and a route to induction into prestigious senior societies. Thus extracurricular participation became central to student life and social advancement, an ethos that became a template for collegiate life across the United States. By 1870, Yale was the largest undergraduate institution in the country. The growth of the student body prompted major growth in the college's physical campus, the greatest expansion of which occurred in 1933, when a gift of Edward S. Harkness created and endowed eight residential colleges. Modeled after the college system of Oxford and Cambridge Universities, the colleges were intended to be the social and residential centers of undergraduate life while leaving academic programs under the oversight of university's departments. Two additional colleges were built by 1940, and two more in the 1960s. For most of its history, study at Yale was almost exclusively restricted to white Protestant men, often the children of alumni. Documented exceptions to this paradigm include Hawaiian native Henry ʻŌpūkahaʻia, who became a student of Yale President Timothy Dwight in 1809, and Black abolitionist James W. C. Pennington, who was allowed to audit theology courses in 1837. Moses Simons, a descendent of a slave-holding South Carolinian family, has been suggested to be the first Jew to graduate from Yale. Though his maternal ancestry is disputed, he may have also been the first person of African American descent to graduate from any American college. In 1854, Yung Wing graduated from the college and became the first student from China to graduate from an American university, and in 1857, Richard Henry Green became the first African American man to receive a degree from the college. Until the rediscovery of Green's ethnic descent in 2014, physicist Edward Bouchet, who stayed at Yale to become the first African American PhD recipient, was believed to also be the first African American graduate of Yale College. In the early 20th century, the student body was predominantly "old-stock, high-status Protestants, especially Episcopalians, Congregationalists, and Presbyterians"—a group later called "WASPS" (White Anglo-Saxon Protestants). By the 1970s it was much more diversified. Enrollment at Yale only became competitive in the early 20th century, requiring the college to set up an admissions process. As late as the 1950s, tests and demographic questionnaires for admission to the college worked to exclude non-Christian men, especially Jews, as well as non-white men. By the mid-1960s these processes were becoming more meritocratic, focusing on recruitment of a racially, economically and geographically diverse student body. This meritocratic transition encouraged the university to establish the first "need-blind" admissions policy in the United States. After several decades of debate about coeducation, Yale College admitted its first class of women in 1969. In recent years, the college has focused on international recruitment, quadrupling the fraction of international students admitted between 1993 and 2013. Yale College is a constituent school of Yale University and contains a dependent system of residential colleges. Its executive officer is the Dean of Yale College, who is appointed to a five-year term by the Yale Corporation. The Dean oversees undergraduate academic curriculum, extracurricular activities, and student discipline, but does not have direct control over the residential colleges. The position is currently held by Marvin Chun, professor of neuroscience. All of college's faculty are members of the Yale Faculty of Arts & Sciences, and are thereby jointly affiliated with the Graduate School of Arts and Sciences. Tenured members of the Faculty of Arts & Sciences constitute the Board of Permanent Officers, who govern the school's curriculum and programs. Most undergraduate courses and majors are offered under the purview of academic departments, divisions of Arts & Sciences faculty which offer undergraduate and graduate curriculum. In addition, the faculties of three Yale professional schools, the School of Art, School of Architecture and School of Forestry & Environmental Studies, also offer undergraduate programs. Residential colleges, which are funded and controlled by the university, have separate administration and limited self-governance. The Heads of College (before 2006 called Masters), usually tenured faculty members, are appointed to renewable, five-year terms by the Yale Corporation to oversee the affairs of each college. Residential college Deans, who are supervised by the Dean of Yale College, are in charge of undergraduate academic oversight. Each residential college is governed by its Head of College, Dean, and Fellows, and has a college council of students with limited jurisdiction over student affairs. Issues affecting multiple colleges are governed by the Council of the Heads of College (before 2016 called the Council of Masters), composed of the Heads of College of the fourteen colleges. The most distinctive feature of Yale College undergraduate life is the residential college system. :19 The system was established in 1933 through a gift by Yale graduate Edward S. Harkness, who admired the college systems at Oxford University and Cambridge University. Each college consists of dormitory buildings surrounding an enclosed courtyard, and features a dining hall, library, and student facilities ranging from printing presses to darkrooms. Each is led by a Head of College, a faculty member who serves as its chief administrator, and a Dean, who oversees student academic affairs. University faculty and distinguished affiliates are associated with the colleges as fellows. Unlike their English forerunners, the colleges do not administer academic degree programs or courses of study, but they do sponsor academic seminars that fall outside the normal departmental structure of the university, and the Heads of College host lectures and teas for the colleges that attract high-profile visitors. Harkness' gift built and endowed eight colleges, completed from 1932 to 1934. Additional colleges were opened in 1935 (Timothy Dwight College), 1940 (Silliman College), 1962 (Morse College and Ezra Stiles College), and 2017 (Pauli Murray College and Benjamin Franklin College), bringing the present-day number to fourteen. The first ten colleges were designed in Collegiate Gothic and Georgian Revival styles; the two colleges built in the 1960s are Modernist reinventions of the college plan. In 2007, Yale announced the construction of two additional Collegiate Gothic residential colleges near Science Hill, which opened in 2017. Residential colleges are named for important figures or places in university history or notable alumni; they are deliberately not named for benefactors. Berkeley College – named for the Rt. Rev. George Berkeley (1685–1753), early benefactor of Yale. Branford College – named for Branford, Connecticut, the town in which Yale was founded. Davenport College – named for Rev. John Davenport, the founder of New Haven. Often called "D'port". Ezra Stiles College – named for the Rev. Ezra Stiles, a president of Yale. Designed by Eero Saarinen. Jonathan Edwards College – named for theologian and Princeton University co-founder Jonathan Edwards. Grace Hopper College – named for Admiral Grace Murray Hopper, Yale Ph.D. and computer pioneer. Until 2017, this college was named for John C. Calhoun, vice-president of the United States. The smallest college. Morse College – named for Samuel Morse, inventor of Morse Code. Also designed by Eero Saarinen. Pauli Murray College – named for civil rights activist, legal scholar and religious pioneer Pauli Murray. Pierson College – named for Yale's first rector, Abraham Pierson. Saybrook College – named for Old Saybrook, Connecticut, where Yale was briefly located. Timothy Dwight College – named for the two Yale presidents of that name, Timothy Dwight IV and Timothy Dwight V. Usually called "T.D." Trumbull College – named for Jonathan Trumbull, 18th-century governor of Connecticut. Student publications at Yale date back as far as 1806, but the earliest still in print, the Yale Literary Magazine, was founded in 1836 and is believed to be the oldest surviving literary review in the United States. Undergraduate publications like the Yale Banner, a yearbook, and The Yale Record, a humor magazine, followed suit, often around the same time similar publications were established at Harvard and Princeton. The Yale Daily News, established in 1878, was a relative latecomer but became the flagship campus daily, and continues to publish during every weekday of the undergraduate academic term. These publications have been joined by many 20th-century debuts, including The Yale Herald and The New Journal. In 1832, a rift over Phi Beta Kappa inductions between the college's two debating societies, Linonia and Brothers in Unity, caused seniors established the first secret society at the university, Skull and Bones. Skull and Bones "tapped" select juniors for membership as seniors, a ritual later adopted by all undergraduate senior societies. Since then, senior societies have proliferated at Yale, with recent estimates of 41 existing societies and senior class membership ranging from ten to fifty percent of each class. Although once carefully guarded, the "secrecy" of these senior societies is dubious; their existence is widely known and membership rolls for most are published yearly. Ten present-day societies—Skull and Bones, Scroll and Key, Book and Snake, Wolf's Head, Elihu, Berzelius, St. Elmo, Manuscript, Shabtai, and Mace and Chain—have private buildings near campus; many other societies have a fixed on-campus meeting space where they meet twice a week. Some of the oldest society buildings are enclosed and windowless; members refer to them as "tombs." Their activities have varied over time and across societies, but most societies meet for dinners, discussion, drinking, and long-form disclosure of members' life history. Despite a long history of social exclusion—of Jews and women in particular—many of these societies have prioritized membership diversity in the last several decades. The semi-secrecy and influential membership of Yale's older senior societies has attracted wide interest and scrutiny, particularly when both 2004 U.S. presidential candidates were members of Skull and Bones. The anti-Tom novel Aunt Phillis's Cabin by Mary Henderson Eastman is partially set in Yale College in the 1850s. In the American TV series Gilmore Girls, Rory Gilmore attends Yale College, choosing it over Harvard. ^ a b "Yale 'Factsheet'". Yale University Office of Institutional Research. Archived from the original on July 1, 2014. Retrieved March 11, 2014. ^ "Alumni (living) by Yale school". Yale University Office of Institutional Research. Archived from the original on July 1, 2014. Retrieved March 23, 2014. ^ Pierson, George W. (2004). Yale: A Short History (2nd ed.). Stinehour Press. Retrieved June 24, 2014. ^ Conniff, Richard (March 2015). "How The Sciences Came to Yale". Yale Alumni Magazine. Retrieved April 29, 2015. ^ a b Thelin, John R. (2013). A History of American Higher Education (2nd ed.). Baltimore: Johns Hopkins University Press. ISBN 9781421404998. ^ Pierson, George W. (1955). Yale: The University College, 1921–1937. New Haven: Yale University Press. ^ Schiff, Judith Ann (July 2004). "Aloha Blue". Yale Alumni Magazine. Retrieved April 29, 2015. ^ Schiff, Judith (January 2006). "Pioneers". Yale Alumni Magazine. Archived from the original on December 28, 2014. Retrieved May 28, 2015. ^ Oren, Dan (1986). Joining the Club: A History of Jews and Yale. New Haven: Yale University Press. ^ Kaminer, Ariel (March 16, 2014). "New Contenders Emerge in Quest to Identify Yale's First African-American Graduate". New York Times. Retrieved May 28, 2015. ^ Schiff, Judith (May 2014). "The life of Richard Henry Green". Yale Alumni Magazine. Retrieved May 28, 2015. ^ a b Kabaservice, Geoffrey (December 1999). "The Birth of a New Institution". Yale Alumni Magazine. Archived from the original on April 2, 2015. Retrieved May 28, 2015. ^ Karaben, Jerome (2005). The Chosen: The Hidden History of Admission and Exclusion at Harvard, Yale, and Princeton. Houghton Mifflin Harcourt. ISBN 9780618773558. ^ Soares, Joseph A. (2007). The Power of Privilege: Yale and America's Elite Colleges. Stanford, CA: Stanford University Press. ISBN 9780804756389. ^ "Yale Will Admit Women in 1969; May Have Coeducational Housing". Harvard Crimson. November 15, 1968. Retrieved April 1, 2015. ^ Wildavsky, Ben (2012). The Great Brain Race: How Global Universities are Reshaping the World. Princeton University Press. p. 33. ISBN 9780691154558. ^ Christofforsen, John (August 30, 2012). "Yale President Levin Stepping Down after 20 Years". Associate Press. Retrieved July 29, 2014. ^ a b "The Yale Corporation By-Laws". Yale University. September 28, 2013. Retrieved March 26, 2014. ^ Unlike many American universities, Yale does not have a system of divisional minors. ^ "Faculty Handbook" (PDF). Yale University Office of the Provost. August 2013. Retrieved March 26, 2014. ^ "Yale College Programs of Study, Forestry & Environmental Studies". Yale College Dean's Office. Retrieved March 26, 2014. ^ "Residential Colleges". Yale College. Retrieved March 26, 2014. ^ Ryan, Mark B. (2001). A Collegiate Way of Living: Residential Colleges and a Yale Education (PDF). New Haven, CT: Jonathan Edwards College. ISBN 9781402850615. Retrieved March 26, 2014. ^ "Residential College Seminar Program". ^ a b Winstead, J. Lloyd (2013). When Colleges Sang: The Story of Singing in American College Life. University of Alabama Press. ISBN 9780817317904. ^ a b Duchan, Joshua S. (2012). Powerful Voices: The Musical and Social World of Collegiate A Cappella. University of Michigan Press. ISBN 9780472118250. ^ Howard, James M. (1959). "An Authentic Account of the Founding of the Whiffenpoofs" (PDF). Archived from the original (PDF) on 2011-07-18. Retrieved July 29, 2014. ^ Kelley 1999, pp. 226. ^ Mott, Frank L. (1930). A History of American Magazines, 1741-1850. 1. Harvard University Press. p. 488. ISBN 9780674395503. ^ Welch, Lewis Sheldon; Camp, Walter (1899). Yale, her campus, class-rooms, and athletics. Boston: L. C. Page and Company. Retrieved March 23, 2014. ^ Schiff, Judith (Sep–Oct 2004). "How The Secret Societies Got That Way". Yale Alumni Magazine. Retrieved July 29, 2014. ^ a b Alden Branch, Mark (Jul–Aug 2014). "Open Secrets". Yale Alumni Magazine. Retrieved August 5, 2014. ^ a b c Schenkel, Ben (March 30, 2012). "Tapping in". Yale Herald. Archived from the original on March 5, 2014. Retrieved July 29, 2014. ^ Robbins, Alexandra. "George W., Knight of Eulogia". The Atlantic. Retrieved July 29, 2014. ^ a b Robbins, Alexandra (2002). Secrets of the Tomb: Skull and Bones, the Ivy League, and the Hidden Paths of Power. Little, Brown. ISBN 9780759527379. ^ Oren, Dan A. (1986). 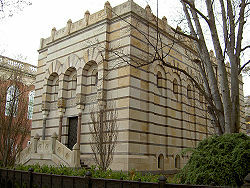 Joining the Club: A History of Jews and Yale. New Haven: Yale University Press. ISBN 9780300033304. ^ "Yale Alumni Block Women in Secret Club". New York Times. September 6, 1991. Retrieved February 28, 2009. ^ Brown, Buster (February 25, 2013). "Skull & Bones: It's Not Just for White Dudes Anymore". The Atlantic. Retrieved July 29, 2014. ^ Taylor, Frances Grandy (March 30, 2000). "Yale's Not-so- Secret Societies". Hartford Courant. Retrieved July 29, 2014. Kelley, Brooks Mather (1999). Yale: A History (2nd ed.). New Haven: Yale University Press. ISBN 9780300078435. Clap, Thomas (1766). The annals or history of Yale-college. John Hotchkiss and B. Mecom. Retrieved March 23, 2014. Welch, Lewis Sheldon; Camp, Walter (1899). Yale, her campus, class-rooms, and athletics. Boston: L. C. Page and Company. Retrieved March 23, 2014. Pierson, George W. (1952). Yale College, An Educational History (1871–1921). New Haven: Yale University Press. Pierson, George W. (1955). Yale: The University College (1921–1937). New Haven: Yale University Press. Holden, Reuben A. (1967). Yale: A Pictorial History. New Haven: Yale University Press. ISBN 9780300005653. Warch, Richard (1973). School of the Prophets: Yale College, 1701-1740. New Haven: Yale University Press. ISBN 9780300016055. Kabaservice, Geoffrey. (2004). The Guardians: Kingman Brewster, His Circle, and the Rise of the Liberal Establishment. New York: Henry Holt. ISBN 9780805067620. Soares, Joseph (2007). The Power of Privilege: Yale and America's Elite Colleges. Stanford University Press. ISBN 9780804756389. The Yung Wing Project hosts the memoir of the first Chinese-American graduate of an American university (Yale 1854).